Reading and share top 20 famous quotes and sayings about Sicily by famous authors and people. Browse top 20 famous quotes and sayings about Sicily by most favorite authors. 1. "I had to inspect all fighter units in Russia, Africa, Sicily, France, and Norway. I had to be everywhere." 2. "Sicily is paradise. I live in paradise. Now pass the pasta please." 3. "Student journeys which were important to me were Sicily, Greece, and Egypt, where I really saw these buildings, and that is where you're able to grasp what things mean." 4. "The failure of Christianity in the areas west from Sicily was even greater, and was increased by the spread of Arab outlooks and influence to that area, and especially to Spain." 5. "I think that my interpretation of Italian was a lot more southern than what my husband cooks. You know, I grew up in Queens and in Brooklyn, and we - really, it's more southern. It's Naples and Sicily. It's heavier. It's over-spiced. And like most Americans, I thought spaghetti and meatballs was genius." 6. "Who would condescend to strike down the mere things that he does notfear? Who would debase himself to be merely brave, like any commonprizefighter? Who would stoop to be fearless--like a tree? Fight thething that you fear. You remember the old tale of the English clergymanwho gave the last rites to the brigand of Sicily, and how on hisdeath-bed the great robber said, 'I can give you no money, but I cangive you advice for a lifetime: your thumb on the blade, and strikeupwards.' So I say to you, strike upwards, if you strike at the stars." 7. "I'll go to the south of Sicily in the winter, and paint memories of Arles – I'll buy a piano and Mozart me that – I'll write long sad tales about people in the legend of my life – This part is my part of the movie, let's hear yours"
8. "I hate and detest Sicily in so far as I love it, and in so far as it does not respond to the kind of love I would like to have for it." 9. "Maybe the whole of italy is becoming a sort of Sicily." 10. "My memories of my childhood are wonderful memories. I feel that I was privileged because I grew up in a beautiful city. It is Catania, on the eastern coast of Sicily. It's a place filled with sun, close to the beach." 11. "I was born in Messina, Sicily. I stayed there until I was 18 and finished my studies." 12. "In Sicily, women are more dangerous than shotguns." 13. 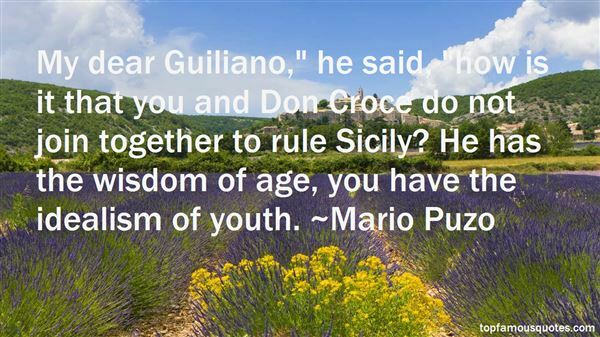 "My dear Guiliano," he said, "how is it that you and Don Croce do not join together to rule Sicily? He has the wisdom of age, you have the idealism of youth." 14. "Preparing the communal evening meal sometimes caused arguments. Every village in Sicily had a different recipe for squid and eels, disagreed on what herbs should be disbarred from the tomato sauce. And whether sausages should ever be baked." 15. "The villagers and the farmers here tell the story of Demeter and Persephone with all the fresh wonder and anguish of a thing only just happened. They tell it in the same way they tell the story of Mary and Jesus. They believe the stories with equal fervor, resonant as they are of their own stories. Allegiance does not shift but only enlarges its endearment to hold both mothers—one with her crown of woven corn husks, the other shrouded in a rough woven veil. Why must we pray to only one? To us, they are the same. Le addolorate. Grieving women. In Sicily, the sacred and the profane are kin." 16. "My dad lives in Sicily, so I'm half Italian and half Irish - it's a fiery combination." 17. "My dear Homer, if you are really only once removed from the truth, with reference to virtue, instead of being twice removed and the manufacturer of a phantom, according to our definition of an imitator, and if you need to be able to distinguish between the pursuits which make men better or worse, in private and in public, tell us what city owes a better constitution to you, as Lacedaemon owes hers to Lycurgus, and as many cities, great and small, owe theirs to many other legislators? 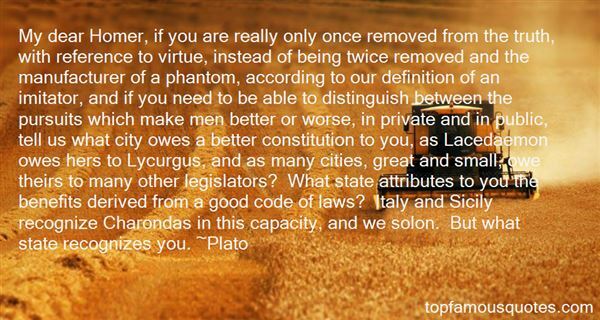 What state attributes to you the benefits derived from a good code of laws? Italy and Sicily recognize Charondas in this capacity, and we solon. But what state recognizes you." 18. "Many critics of the Crusades would seem to suppose that after the Muslims had overrun a major portion of Christendom, they should have been ignored or forgiven; suggestions have been made about turning the other cheek. This outlook is certainly unrealistic and probably insincere. Not only had the Byzantines lost most of their empire; the enemy was at their gates. And the loss of Spain, Sicily, and southern Italy, as well as a host of Mediterranean islands, was bitterly resented in Europe. Hence, as British historian Derek Lomax (1933-1992) explained, 'The popes, like most Christians, believed war against the Muslims to be justified partly because the latter had usurped by force lands which once belonged to Christians and partly because they abused the Christians over whom they ruled and such Christian lands as they could raid for slaves, plunder and the joys of destruction.' It was time to strike back." 19. "I collect church collapses, recreationally. Did you see the recent one in Sicily? Marvelous! The facade fell on sixty-five grandmothers at a special mass. Was that evil? If so, who did it? If he's up there, he just loves it, Officer Starling. Typhoid and swans - it all comes from the same place." 20. "My family was all born in Sicily and I'm Italian-American. They're the real thing. They're authentic Italians, and honestly they're the most open-minded, nicest people in the world and nothing can really offend them. That's the way I think true Sicilians are." Despair is deep. An abyss that swallows dreams. A wall at the world's end. Behind it I await death. Because all our work has come to this."